Heat the butter in a pan. Briefly sauté the shallots and potatoes, pour in the stock, bring to the boil, cover and simmer for approx. 15 mins. Add the wild garlic and spinach, allow to wilt. Blend the soup and season. Finely chop the reserved wild garlic. Heat the butter in a frying pan. Toast the bread with the wild garlic for approx. 3 mins. until golden, remove, season with salt, set aside. Combine the cheese, crème fraîche and lemon zest, stir until smooth, season. 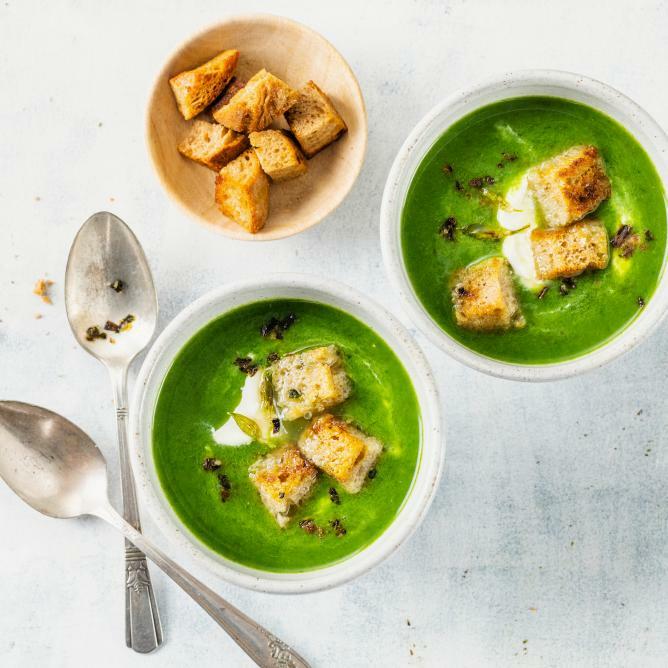 Serve the soup in deep bowls, garnish with the cream and croutons.